Valentine’s Day has a habit of creeping up on us, especially if you’re a busy parent! The kids need their Valentines bought or made, and then there’s the class party that you may have forgotten all about. What to do when you need to make treats for the entire class in a pinch? 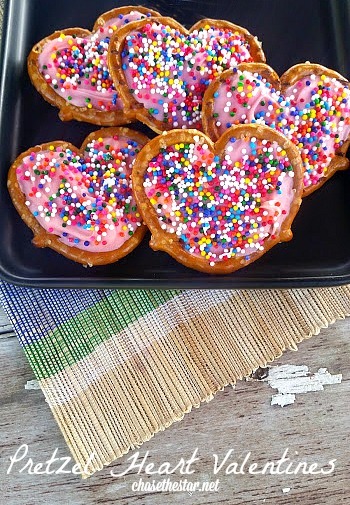 Make these Pretzel Heart Valentines! They are not only cute, but can save the day when you’re low on time! Place the candy melts in a bowl, set in the microwave on high for about 90 seconds. In the meantime, place wax paper on a cookie sheet and set the pretzels out in a thin layer. Take the candy melts out of the microwave, add a couple drops of food coloring and mix well. Fill a piping bag (or in a sandwich bag, then cut the tip off the corner end) with the candy mixture, and squeeze an even layer over each pretzel, smoothing it out with a spoon. Add the sprinkles while the candy is still warm. Allow to set for about 15 minutes (tip: place them in the fridge to speed it up). Place them on a pass around tray, or wrap them individually in clear cellophane, embellished in pretty ribbon! The subtle combination of salty and sweet is the perfect treat for school aged kids and adults alike! 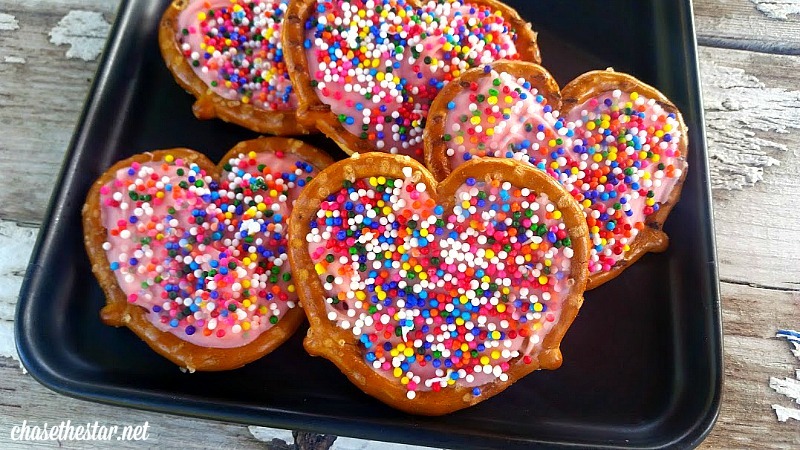 Any way you choose to share these treats, they are sure to be a hit! For more fun recipes, crafts, and DIY’s, visit me at Chase the Star.